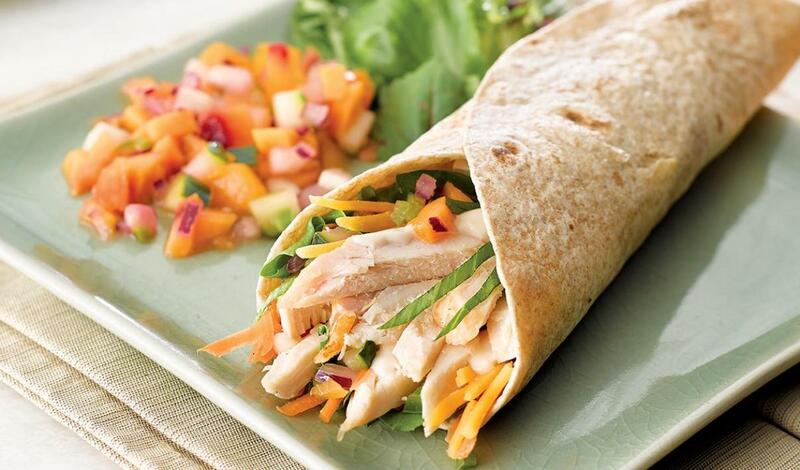 A cool and spicy chicken wrap that's perfectly sweet created with a layer of Hellmann's® Light Mayonnaise. Combine the Hellmann's® Light Mayonnaise with maple syrup; reserve. On a whole wheat tortilla, spread with prepared Maple Mayonnaise. In the middle of the tortilla place chicken, cheddar cheese, carrot, lettuce and prepared Cucumber Peach Salsa. Wrap and serve.